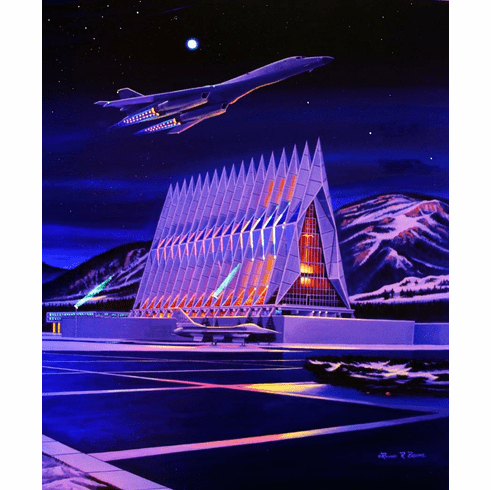 Home | Air Force Academy Artwork By Richard Broome | Available USAFA Class Prints & Commemorative works of Art By Rick Broome | USAFA Class Prints: 2000-2010 | USAFA 2001 Commemorative Class Print "Fired Up!" Canvas Editions | "Fired Up!" Starlite Edition: DEPOSIT! Home | Air Force Academy Artwork By Richard Broome | Available USAFA Class Prints & Commemorative works of Art By Rick Broome | USAFA AVAILABLE STARLITE & RE-MASTERED EDITIONS & COMMISSIONS | "Fired Up!" Starlite Edition: DEPOSIT! Framing is included on all editions. Average delivery schedule is 6-12 months for Standard Starlites without customizations.